FBI Director James Comey: We are going through the killer's life, as I said, especially his electronics, to understand as much as we can about his path and whether there was anyone else involved, either in directing him or in assisting him. So far we see no indication that this was a plot directed from outside the United States, and we see no indication that he was part of any kind of network. John Bachman: That's what makes it all so concerning. You don't even have to really travel or train with these terrorist groups, you can be inspired by a video you saw online and turn into Omar Mateen. We turn now to Pete Hoekstra. He's the Shillman Senior Fellow with the Investigative Project on Terrorism. He's also the former chair of the House Intelligence Committee and a good friend of Newsmax. Pete, it's great to talk to you again. Bachman: When you hear James Comey talk about the fact that there appears to be no outside direction on, prior to this attack, but ISIS of course claims responsibility and celebrates the terrorist here, what is your reaction? Hoekstra: Well the good news is the message that this is not a network. There is, at least we haven't identified a network of likeminded individuals who may have been coordinating attacks. That's good information and that's good news. The bad news is you know he's operating alone, he was perhaps radicalized online or you know with some acquaintances in the Orlando area, and that just tells us how difficult it is to identify these people in a country of over 350 million people, and that a person like this, a single person, can go out and create this kind of horrific attack. Bachman: Alright, I want to welcome in some callers before we get on the next topic. We have Luis, who is calling from St. Marie, Vermont, or sorry, Montana. Luis, good to have you with us. Caller (Louis): Hello, can you hear me loud and clear? Bachman: Yes, loud and clear. Go ahead. Caller (Louis): Good. Do you expect any action from the president and the Congress? That will happen when Hell freezes over. I have no confidence in Congress. I have no confidence in president of the United States. The sheriff of that county has to do whatever he has to do within reason and within the law. And I'm voting for Donald Trump this November. I'd rather not take any chances. I'd rather have them vet every Muslim coming into this country, that's (UI few words) they cannot come inside. Bachman: Well, Louis, the problem with that line of thought is that this guy was born in New York, just like the San Bernardino terrorist was born in Chicago. These are homegrown terrorists. And by preventing Muslims from immigrating to this country or preventing refugees, and while I believe there needs to be a better process for vetting them, preventing them wouldn't have prevented this attack. Pete, go ahead. Hoekstra: Well I think John we're missing one point here. 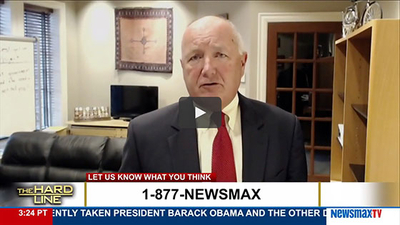 Hoekstra: ISIS is winning right now. Hoekstra: ISIS has you know they've created four failed states, with Iraq, Syria, Libya and Yemen. They've got momentum. The number of victims that are being killed every year as a result of radical jihadist activities has grown from around 2,500 in 2001 to between 25,000 and 30,000 people globally now each and every year. This is what in some cases may be attracting this guy in Orlando to ISIS and radical jihadism because he sees they're winning. Bachman: That's right. That's right, Pete. We have not figured out a way to defeat the ideology. And that's how they're able to win. That's how they're able to inspire guys like Mateen. Bachman: Yeah. Well I think we had another caller. Did we lose that caller? OK, we lost that caller. But you know Pete, I wonder also, you talk about the Middle East, obviously there's a new, I don't know if it's more momentum towards actually declaring some sort of war, against ISIS. How do you feel about that? Do we need a declaration of war against ISIS? Hoekstra: I think actually Congress declaring war, hopefully in a bipartisan manner, establishing the parameters for what that would be against radical jihadism, I think that would be helpful. We have now been in this process for 15 years. We've been losing ground. We as a nation are now divided. Republicans and Democrats are divided. If Congress, and this is a big if, if Congress could come together, outline a declaration of war and bring Congress and the American people and the executive branch together to confront this threat, that would be a huge step forward. It's also a big, big if. Bachman: A big if, but we should also point out there is bipartisan support for it. Tim Kaine, Democrat from Virginia, he's called for it. A number of Republicans have called for it as well. We are still fighting this war against ISIS based on a military authorization for al-Qaida. And if anybody knows about the differences between the two groups, they are vast and much different organizations and much different strategy. Pete, as always, great to see you. Time is short. Bachman: Love to talk with you some more and we'll have you back real soon here on The Hard Line. Thanks for being with us. There's two separate issues here. We're talking about gun control; of course that's part of the domestic conversation. The other issue is what to do with ISIS in the Middle East. They will be able to continue to reach into the computer screens in places like Fort Pierce, Fla., where this Omar Mateen was from, and inspire people who don't have it all going on up top. And that's going to continue until we can take out that threat, their ability to win the propaganda war, as Congressman Hoekstra was talking about. Genital guilt seems to be a feature of Muslimism; Saudi Arabia, UAE, Yemen, Nigeria, Brunei etc all have death penalty for gays. Islam and Muslims generally , not just gay Muslims, feel guilty about their sexuality. Genital guilt is a feature of the Abrahamic religions.
" You don't even have to travel or train - - - you can be inspired by video online and turn into Omar Mateen." Well no, I couldn't. I would have to be from a Muslim family and believe the utter BS of the Koran before I would be open to the Terror propaganda of other angry Muslims . I would have to be set up by developing an angry personality where religious belief becomes a means of coping with negative early relationships (strict rules, totally dominating father etc) and where religion has a very strong EMOTIONAL connection for me. "We have not figured out a way to defeat the ideology". No, YOU have not. But I'm glad you mentioned it because at least you might now be open to taking the time to look at the psychological connection between the nuclear Muslim family, the teachings of the Koran and Hadith, angry adults whose beliefs justify murder and how to use what you learn to develop effective counter propaganda methods. Understanding the psychology of the Religious Personality Disordered person would be the first step. Some years ago in the UK there was a pub bombing in a gay pub. During the trial of the non Muslim perpetrator it was reported that psychologists found he was actually gay. His family /peers judged gays harshly. His resulting guilt was denied and he projected that onto others who were gay. Like Omar Mateen's father, was his father a rules and obedience freak? I'd like to try and disprove my theories that Islam unwittingly conditions the young to develop Religious Personality Disorder and that denying their homosexuality is a prime cause of unconscious fury controlling their behaviour. I have not the resources for this, but I know how to go about it and that is extremely frustrating for me. If you really want to figure out a way to "defeat the ideology" then you would have to undertake this research. Without psychological understanding you could not effectively challenge the Koran. You would not be able to challenge the Koran without by the same token, criticising the Bible and all religion. Do you have the courage to do what is necessary for survival?